The Justice League Arenas have begun. Join the battle to earn Justice League hero shards! 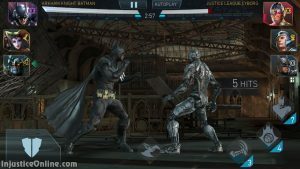 During the upcoming Arena seasons, Justice League Cyborg has a chance to invade any Arena battle up to three times a day. Win that battle and immediately earn Justice League Cyborg shards and his gear! After a life-threatening accident, the body of Victor Stone was reconstructed by his father into an organic computer with biomechatronic body parts. As Cyborg, he is immune to stun attacks, generating power from them instead, and each of his fellow Justice League teammates gain increased damage on basic attacks. To unlock the character you will have to collect 60 shards. 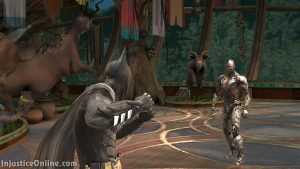 To obtain Justice League Cyborg character shards your Arena battle has be invaded by him. 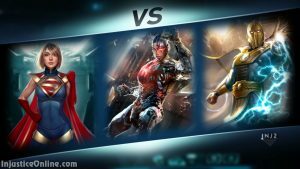 Once this happens, win the battle and you will gain Justice League Cyborg shards and gear. 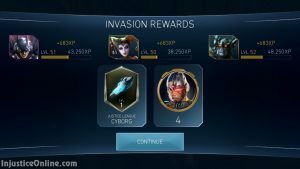 An invasion by Justice League Cyborg can only happen during active times of the event (see schedule below) and only up to three times a day. As with every other reward and challenge you can expect the Justice League Cyborg invasion to happen every once in while so if you have missed it so far you will definitely get another chance.